Some travelers like to pick a vacation destination and leave the details to chance, while others feel the need to carefully plan and schedule their vacation days. Whichever side of the planning spectrum you fall on, you'll want to have an idea of the area's must-see attractions and best places to eat. And the easiest way to know is to check out my favorite travel planning sites for pre-trip planning and apps for making plans on the go. Hopper makes it easy to spot what you'd like to do. It's impossible to overlook the ubiquitous TripAdvisor for planning out your travel agenda. Though you might think of it mostly as a place to find hotel and restaurant reviews, the site has extensive lists of local attractions reviewed and rated by TripAdvisor's users. Just click on "destinations" in the search window and type where you want to go to see not only hotels and flight costs, but also the top attractions, the best-rated restaurants, and upcoming events. It can be a bit information overload, but you're sure to find something of great interest to make your trip one to remember. If you're looking for even more recommendations, Gogobot may be more your style—literally. Gogobot's Tribes section helps guide you to the right travel activities based on your preferred travel style, whether you're looking for adventure, art, culture, nightlife, or something else entirely. Browse by travel style or search for your city to see activities on offer, all rated and reviewed by Gogobot's users. For a more visual experience, try Hopper. 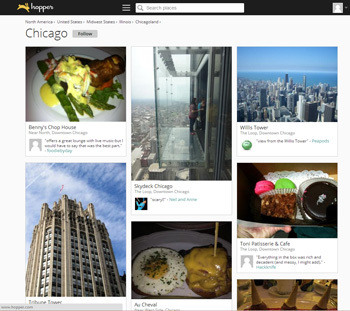 The site lets you endlessly scroll through photos and captions linked to reviews and recommendations posted by Hopper's users. It's a great place to browse if you're not sure of exactly what you're looking for. Peek makes it easy to find a wide variety of activities. If you'd rather find activities that are a bit more off the beaten path, the above sites—all of which tend to show you the most popular attractions and activities—might not be of much help. But don't despair, because there are sites geared towards the unique and unusual, too. Though it only works in select cities and places, including New York, Seattle and Maui, Peek is a great resource for finding activities and excursions. Browse by category, like Food Tours, Sights and Landmarks, What to Do with Kids, Day Trips and What to Do When It Rains, or take a look at the "Perfect Day" plans created by tastemakers, including Rebecca Minkoff, Mark Hix and Jack Dorsey, and site community members. If Peek doesn't have what you're looking for, try Vayable, which lists a wide range of tours hosted by local guides for an insider's experience of your destination. What's available will vary, but you can read reviews from other Vayable users to help you decide which tours are for you. If you're trying to figure out where to eat—that isn't just another chain restaurant—try Urbanspoon. Just search for your destination and you'll find a list of restaurants by popularity, price, and buzz—no matter what your taste and budget, you're sure to find some great eats. If you're looking for a good meal on the go, make sure you have the free Urbanspoon app on your smartphone (available for iOS, Android, Windows Phone and Kindle Fire devices), which will tell you what's nearby. If you've found the perfect place but need a reservation, OpenTable is the place to go. Using their website or the OpenTable app (available for iOS, Android, Windows Phone, Kindle Fire and BlackBerry devices), you can search for local restaurants with—get it?—open tables when you're planning on stopping for a meal. If you know where you want to eat, you can search for a specific restaurant—but you can also browse by location, cuisine type, price, and schedule. If you're looking for anything else—and we do mean anything—Google Maps is your hands-down best resource. 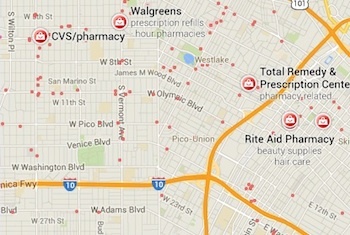 You can load it up on your computer or access it via your smartphone—either by downloading the Google Maps app (available for iOS and Android devices) or navigating to the website on your mobile device—to help you find out where anything is as well as how to get there. You can search Google Maps for specific destinations to see exactly where they are in relation to you—and help you figure out how to get from your hotel to your must-see attraction list, by car, by public transportation, or by foot. However, you can also do more general searches for things like "drug store," "art gallery," "sports bar," "gym" or "museum" to bring up local businesses matching those descriptions—and easy directions to get there. Plus, the mobile app has a feature called "Explore nearby," which surfaces places by categories, including eat, drink, play and shop, based on your location. Now that you've got planning covered, all that's left to do is pack your bags and get ready to have a great time. Personally I love zerve.com for booking all my fun adventures whenever I travel!